5-19mm sizes and 2-22mm sizes available. Steps easily into most soils. Top cap with enlarged slot for easy threading of netting top wire. FiberTuff Clips enable FiberTuff 19mm posts (only) to hold additional rope, tape, twine or MaxiShock. For ends, corners and major directional changes with netting. 7" long , 2.5" wide step-in foot plate. It is welded to the spike for support. 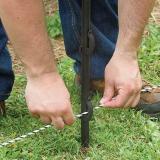 Use the foot plate to step post into the soil at the point of a curve, corner or end. We lean it outwards against the strain because the shaft will curve slightly towards the pull of the fence. Cap can be tapped with a hammer to install post. When using with netting—insert the top strand of net into the top clip. Note: It is not necessary to weave the FiberTuff post into the netting. When using with rope, tape, twine or MaxiShock—use FiberTuff Clips on FiberTuff 19mm posts (only). Remove prior to moving net. Post is not designed to be mechanically driven or heavily struck with a hammer. Enables FiberTuff posts to hold additional rope, tape, twine or MaxiShock. 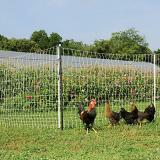 42" tall electric fence to contain chickens and other poultry. “Plus” nets include additional posts to reduce sag and to provide a more versatile fence. 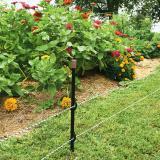 48" tall electric fence to contain chickens and other poultry. “Plus” nets include additional posts to reduce sag and to provide a more versatile fence. 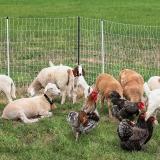 Perimeter fence for chicken yards or to protect gardens from varmints and deer. For use in all seasons. A “less worries” electric netting option. 48" tall. Effective at keeping in: sheep, goats, guard dogs and cattle while keeping out deer, coyotes and bear. An effective electrified fence that keeps in sheep, goats, guard dogs and cattle while keeping out deer, coyotes and bear. 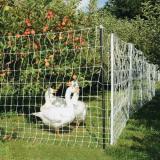 42" tall electric fence keeps in chickens, ducks, geese and other poultry while keeping their predators out. Recommended for heavy, non-flying birds. 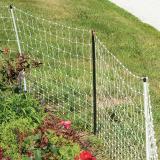 A 42" electric fence for containing goats and sheep while keeping out their predators such as coyotes. 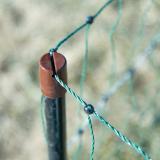 ElectroStop Plus has posts every 6.8 ft. and is designed for goats rather than sheep. More posts means less sag and a more versatile fence. Number of reviews: 62 customers reviewed this product. Recommended: 61 out of 62 said they would recommend this product to a friend. These need more spots to attach to the netting besides just at the top. Once pushed securely in the ground they become shorter than the same height netting. Ended up threading it through the webbing. Sturdy, does the job well! 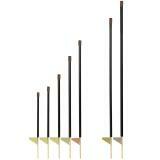 Bought a few of the FiberTuff posts to sturdy up my electric net fencing. These are amazingly strong and do the job wonderfully. 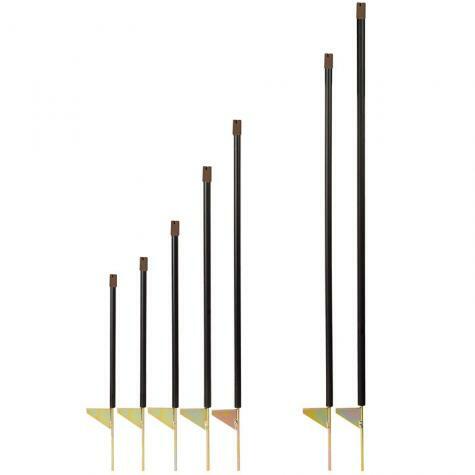 The step-in bottoms are made far superior to any I have found in farm stores and the posts themselves are very sturdy and again far superior to anything found in local farm supply stores. I am very pleased with these posts and will be purchasing more.